Some nights my Husband and I just like to have a few appetizers. This little dish is a real winner for us and a frequent request. It is full of flavor and a perfect little dish for appetizer night. I really hope you take the time to try this one, it never disappoints. I even made this for a surprise birthday we threw for Linda last summer! Remember this Linda? Preheat oven to 375 degrees. Cut bottoms and stalks completely off fresh beets and roast beets at 375 degrees for one hour with skin on. Place in a bowl or container and cover for 30 minutes. Next peel skin off beets, (the skin should easily come off leaving just the beet). Preheat oven to 425 degrees. 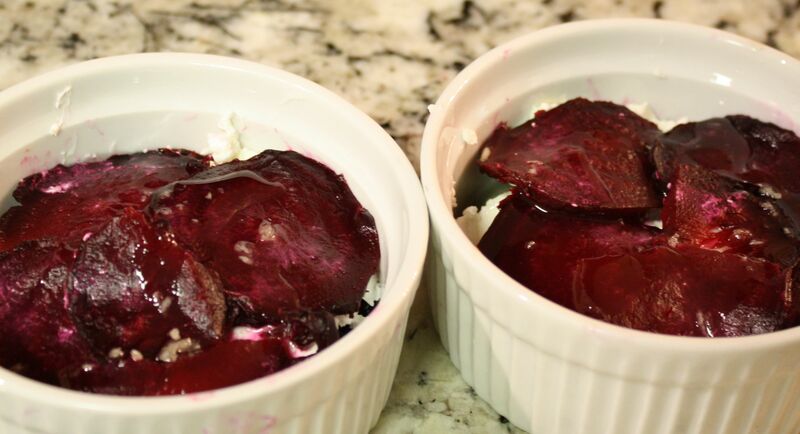 Slice beets into thin rounds and place overlapping in two buttered ramekins. Cover with 1/3 cup of goat cheese in each of the ramekins. Next top with a layer of beets in same overlapping manner. Drizzle the top of each ramekin with 1/2 Tbs reduced balsamic vinegar and bake 425 degrees for 10 minutes. Turn on broiler and broil for 2 – 3 minutes more. Perfect with a salad, toast points or alone. Yummy! I’ve never thought about baking them! I must try this! You’re going to love these!! They are fabulous Chrissy!! Let us know if you make ’em! Yes Heidi I remember!! You and Raf surprised me with family and some friends whom I hadn’t seen in a few years along with a delightful array of your fabulous cuisine…it was truly a special birthday!